Drive with the career bus into your future! The Thuringian Coordination Office NWT organizes a bus transfer to the career fair “women & work” in Frankfurt for interested female students of the Thuringian universities with STEM study offers. Under the motto: “Drive the career bus into your future!” We cordially invite all women who want to exchange and network with like-minded people from science and technology at the trade fair – whether a student, doctoral candidate, returnee, employee or female Executive at a Thuringian university. You have the opportunity to specifically prepare your professional future at the career fair: to talk to top employers in one-to-one interviews, to have your application documents checked, to apply for free application photos, to get job offers, interesting career talks on different topics Listening to topics and getting to know companies in the company slam. 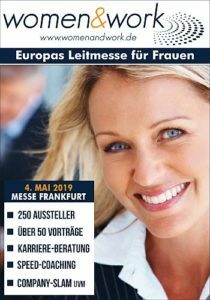 The fair will take place on 4 May 2019 in Frankfurt am Main on the fairground: 10 am-5 pm. The trade fair visit is free of charge. The registration form will be activated on 02 April 2019. You will receive the acceptance / cancellation by email after expiry of the registration deadline. The confirmed application is binding. Cancellation must be notified in writing (also by e-mail) up to 3 days before the start of the event. Please bring sufficient food and drinks – self-catering! Over 100 top employers – including a large number of MINT companies such as Akzo Nobel, BASF, BMW Group, Bosch, Bundesnachrichtendienst, Campana & Schott, Continental, Daimler, Dassault Systèmes, Dell, Deutsche Telekom, SAP or ThyssenKrupp – present themselves at the women & work fair on April 28th and are available to the fair visitors for all questions concerning job entry and change, re-entry or the way up. Anyone who would like to specifically prepare for discussions with the companies at the women & work fair can now register with the exhibiting companies for pre-terminated four-eyes discussions until April 25th. Students of all disciplines who are looking for internships or a company to accompany the thesis, graduates of all departments, returnees or women who are already in the job, but plan a job change can register. A special highlight is the Company SLAM. Just in time for the opening of the congress at 10:00 am, company representatives will come to the podium and present in a maximum of 60 seconds funny, interesting, informative or never-seen-before things. And if you want to bring your application documents up to date, you can use the CV-Check and have your application pictures created. For the first time, women & work organizes a virtual CareerDay for female students for the optimal preparation for the trade fair congress. Students who do not plan to visit women & work can also take part. The CareerDay will take place on Saturday, April 27 from 12-16 clock. 12:00: Which job suits me? 13:00: Stay or go? When does a job change make sense? Participation is free. The registration takes place under http://webinar.womenandwork.de. Register for the career bus! I found the drive to Frankfurt on the whole quite helpful. Since I already knew in advance what I wanted to know (information about internships in banks), I found all the information I was looking for at the fair. Due to the Frankfurt location, we were lucky that a large number of banks and insurance companies were involved in the fair and that we, as mathematicians, could learn a great deal about possible job prospects. I was very glad that you organized this trip as a network. Otherwise, I certainly would not have persisted to go to the fair. The fair itself was great. So gladly again next year! I found the fair very successful and would like to ride again next time. The size of about 100 companies was perfect, not too few offers, but not too many, so you could not rattle everything in one day.